There’s no better way to explore Crete than by foot on a bright blue sun-kissed day, especially if it’s not too hot. Savouring the island’s natural beauty by following the ancient paths, often just goat tracks, is by far the most rewarding way to explore one of the Mediterranean’s most remarkable landscapes. 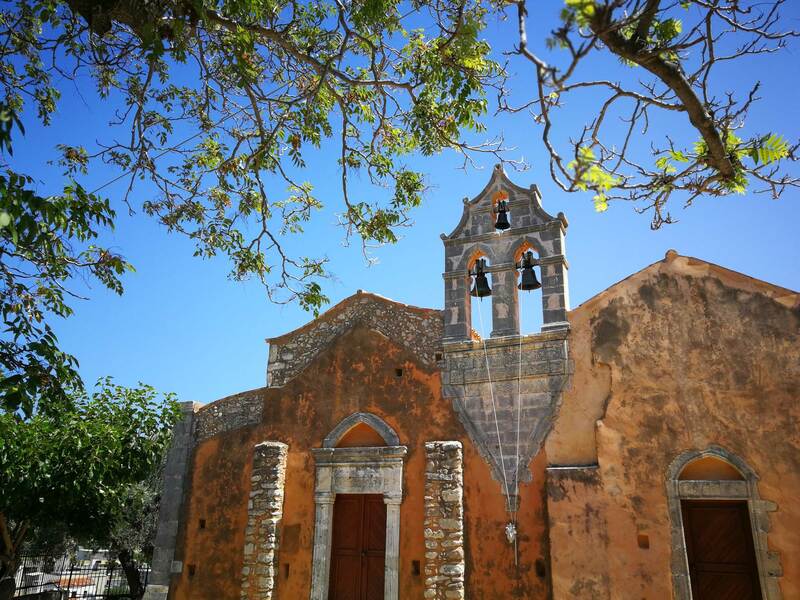 In recent years, visitors wanting to experience the peace and relaxation of a gentle country walk, and be guided on their way, have been helped by the inspiring work of two Dutchmen, two young men from northern Europe who fell in love with Crete, and decided to celebrate their love of the island and share its magical, often hidden walking tracks. 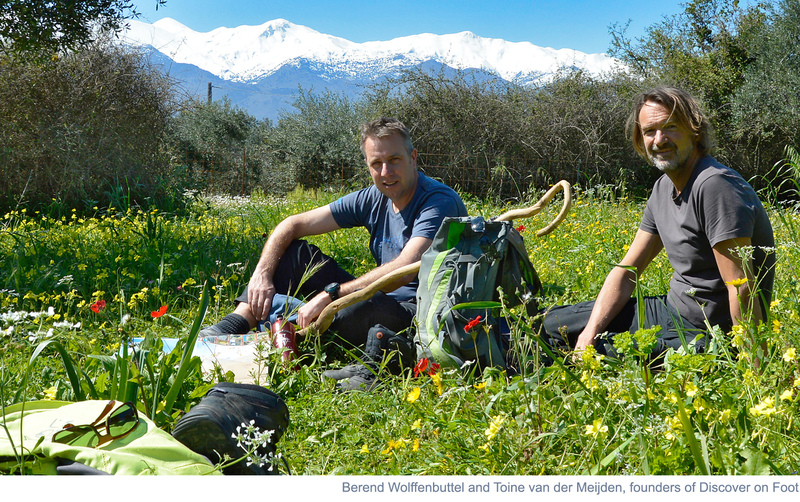 Berend Wolffenbuttel and Toine van der Meijden first came to Crete in the mid-2000s, setting up home – along with their Greek wives Georgia and Elena – in the village of Vamos. Berend’s studies in Holland as an environmental scientist, and Toine’s love of graphic design was the perfect match. In 2009 they started their publishing business Discover on Foot, a highly successful series of guide books (produced in Crete), aimed at visitors who want to leave the beaches behind for a while and head out into the countryside on their own adventures, or explore – with insider tips – some of Crete’s most interesting towns and villages. 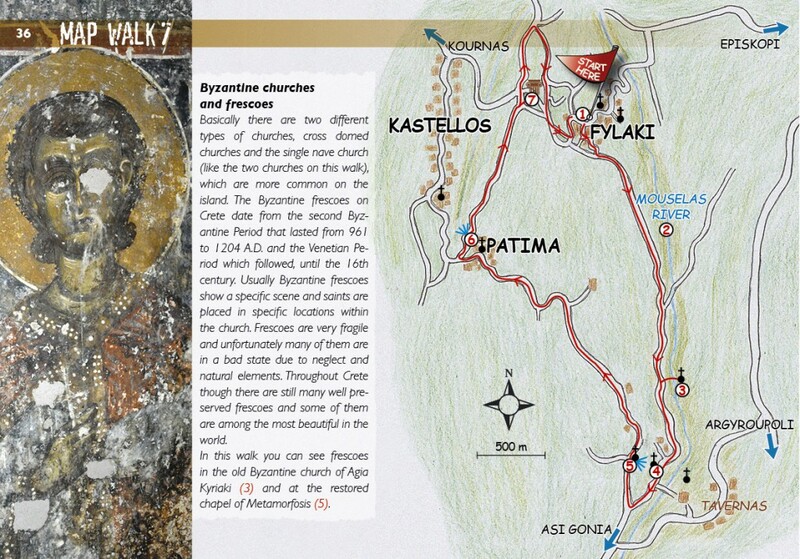 Exploring beautiful byzantine churches: one of the walks featured in Discover Georgioupolis on Foot. Ten years ago they published their first guide Discover Vamos on Foot, and the rest as they say, is history. Over the past decade they have produced a new guide almost every year, covering Almyrida, Chania, Georgioupoli, Kalyves, Kavros and Rethymno, as well as south coast destinations like Myrtos and Agia Galini. Many editions are available in Dutch and German, as well as English. Discover on Foot is a labour of love. Berend handles the research for new projects, writes the text and creates the maps, and once the walks are identified (they check each one carefully), Toine handles the photography and graphic design. 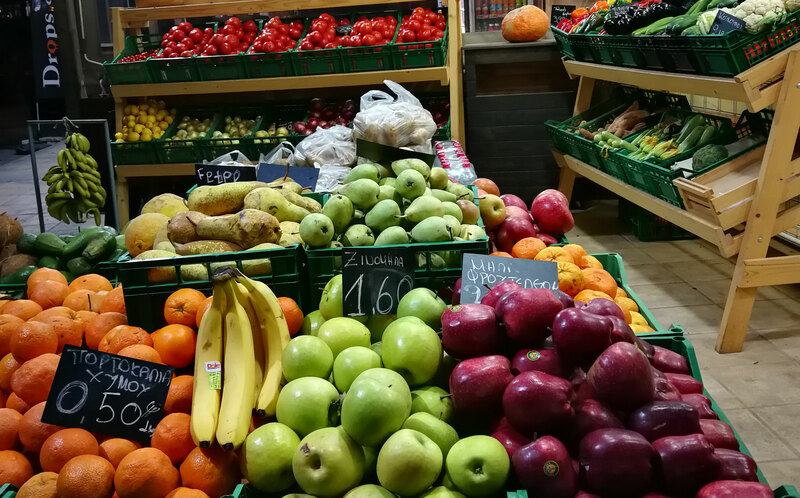 Self-financed, occasionally a guide may be a collaboration with a village’s local cultural association, and include paid advertising, but the business model is always the same – recouping costs from sales, often over a long period. 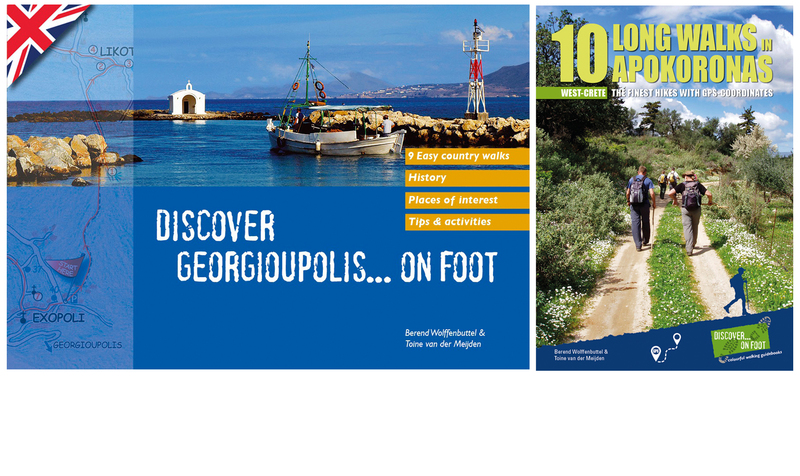 In April 2019 two new guides – Discover Georgioupolis on Foot (a full update of the 2010 edition) and 10 Long Walks in Apokoronas will hit the shelves. With easy-to-read maps, tips on what to see along the routes, and how to make the best out of your day-trip, both are available locally in Georgioupoli from the Anna Supermarket close to the bridge. Discover on Foot can also organise guided walking tours for groups. Call (+30) 6942609679 for details.